So, it's been raining nearly every day for something like four weeks now. 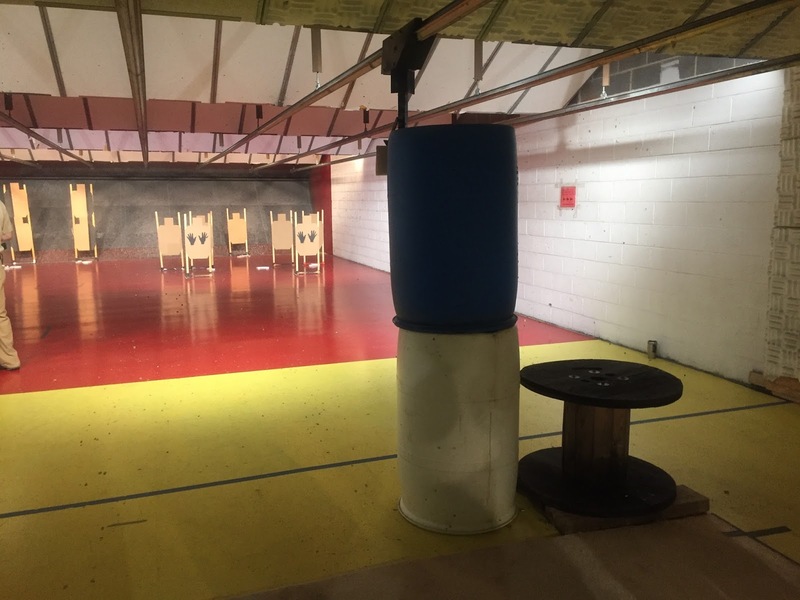 Saturday was no different when I left in the early morning to drive to Charlottesville for the monthly IDPA match at the Rivanna Rifle and Pistol Club. Fortunately the club has an indoor range where the matches are held during inclement weather, so other than making driving tedious, the heavy rains wouldn't dissuade the dedicated shooters. Four stages that tested accuracy and unusual shooting positions awaited us. Stage one had two sets of two stacked targets with the outside edges hidden by hand cover. The stage was shot on the move between four shooting positions arranged in a rectangle. At the start we engaged each target with one shot each strong hand only while moving forward. Then moving to the left engaged the targets weak hand only. From the left position each target was shot freestyle while retreating. Finally while moving to the right, and back to the starting position, we engaged the arrays with a headshot to each target. Besides concentrating on the shooting positions, at each direction change we were also required to do a tactical reload, stowing the partial mag. That also meant that we had to retrieve a previously stowed magazine to complete the headshot string. This was a great stage with which to get your brain working. Stage two, in the same bay, had us shooting from a prone position, between a barrel and a large wooden spool. There were five targets requiring three shots on each. It was a fun stage, and I welcomed the chance to shoot from such a seldom-used position. 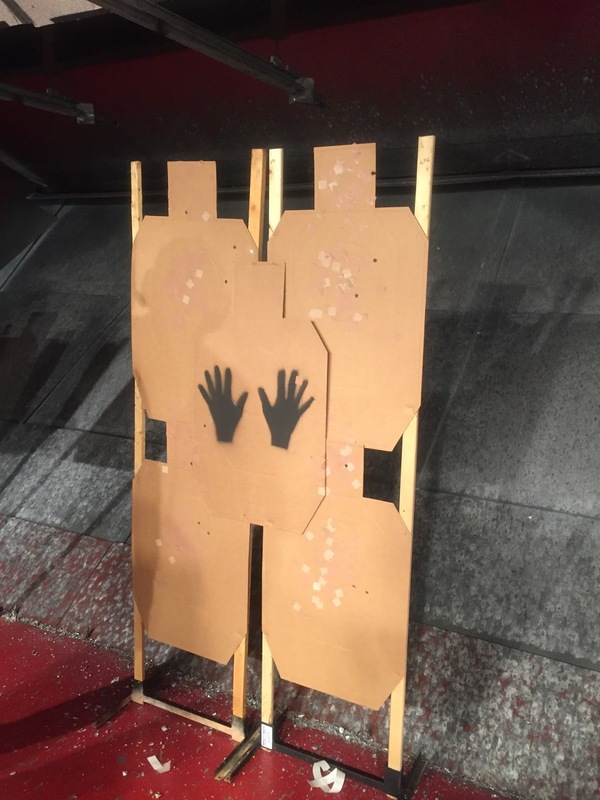 Moving to the second indoor bay, next third stage had an array of four targets centered by a non-threat target. Shooting from a stationary position, the targets required two body and one head shot each. The lower head shots required extra care in aiming as they were partially blocked. Finishing that array we retreated up range, around a barrel stack and then headed back downrange. Arriving at the second position there were three more targets to be engaged in tactical sequence with two shots each. The final challenge of the match was a seated stage; magazines on the table and the unloaded gun in a lidded "IDPA box." There were four targets down range requiring three body shots each, in tactical sequence, followed by a head shot on each. After missing head shots in both stages one and three, I was happy to finally get "warmed up" and make all four on this stage. The match was very challenging and required concentration on both the shooting sequences and the front sight. The lower light level of the indoor range added to the difficulty. While I didn't shoot as accurately as I did at last month's match, I had a lot of fun with the challenges and was moderately pleased with the results. (I think I will work on shooting partially obscured targets in some upcoming practice sessions.) The match director did an excellent job of packing fun stages into a small space. While there was a bit of consternation over the difficulty from some shooters, most folks I think welcomed the opportunity to do something a bit out of the ordinary. And it was a chance to shoot, despite the dreary weather. We were out for a late night the evening prior, and I was sorely tempted to sleep in on Saturday, but at the end of the day, I was very glad I opted to make the rainy morning drive.